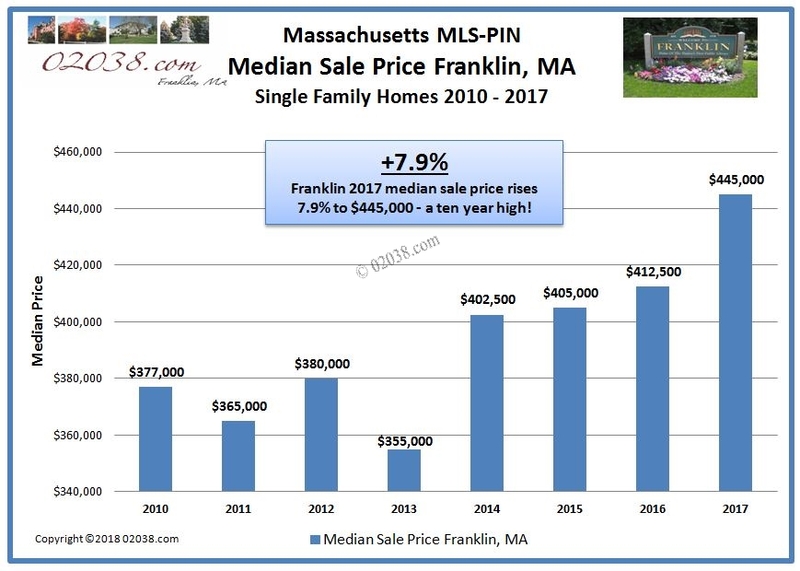 A quick look at two charts will show you the driving force behind the outstanding sales numbers posted during 2017 for single family homes in the Town of Franklin, MA. 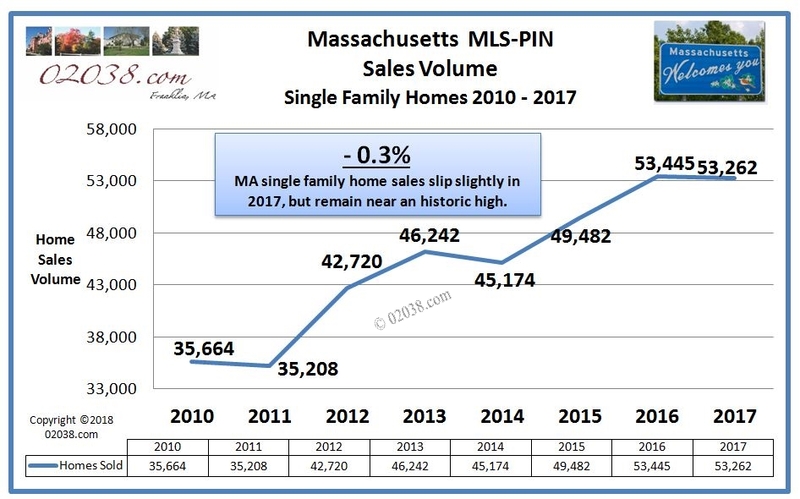 As shown by the above chart, the number of single family homes for sale in Massachusetts has been on a steep decline for the past ten years. 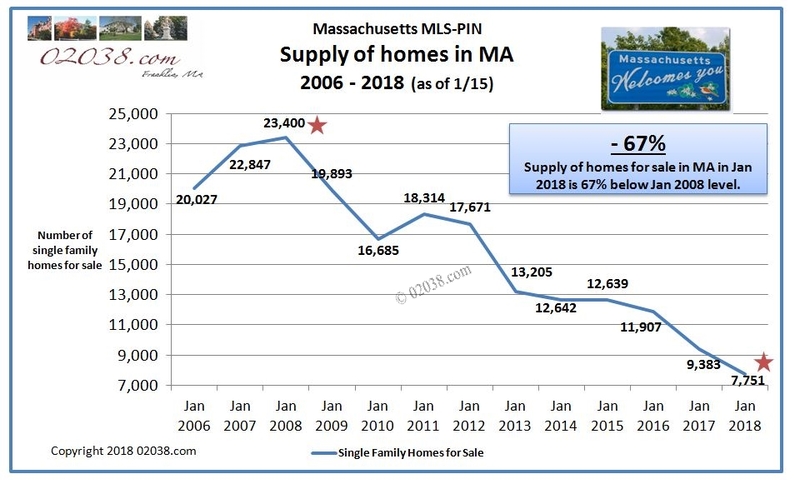 The standing inventory of available homes in MA now stands a staggering 67% lower than what was for sale in January 2008! 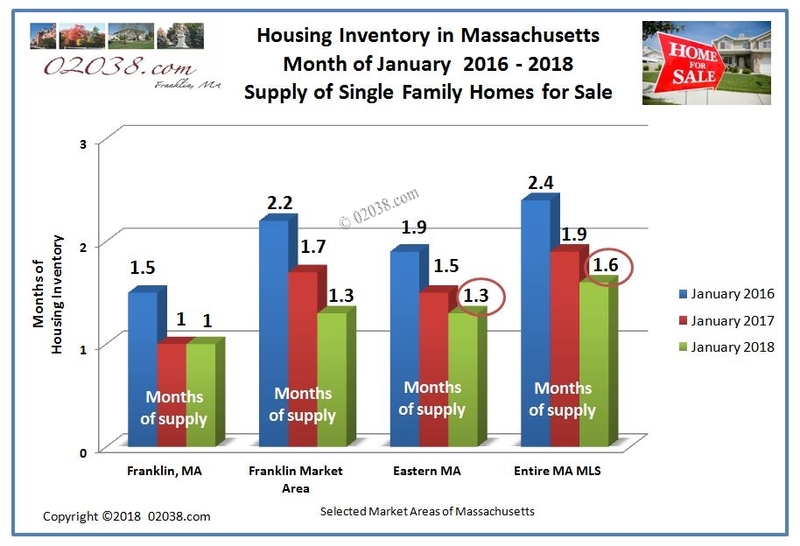 As shown as months of inventory in the chart above, there is an extraordinarily tight supply of available homes in most regions of Massachusetts as 2018 gets underway. 6 months of inventory is typically considered a market in balance. Less than 4 months of inventory denotes a seller’s market. Today’s buyers are confronted with inventories of only 1 month in Franklin and 1.3 months in the regional market of surrounding Franklin. But more importantly, there is only 1.3 months of housing inventory across Eastern Massachusetts and a paltry 1.6 months for all of the Commonwealth. The fact there there is almost nothing to buy in the broadest markets of the Commonwealth makes “daunting” an apt description of the home search challenge facing would-be Massachusetts home buyers! I have posted before on the likely causes of the crushing lack of housing inventory in MA. But whatever the reasons behind it, the dearth of homes for sale in Greater Boston has for the past several years been driving buyers out from the inner Boston suburbs to the I-495 region (and even beyond) in search of affordable housing. And Franklin’s stats for 2017 certainly reflect this surging outward migration. 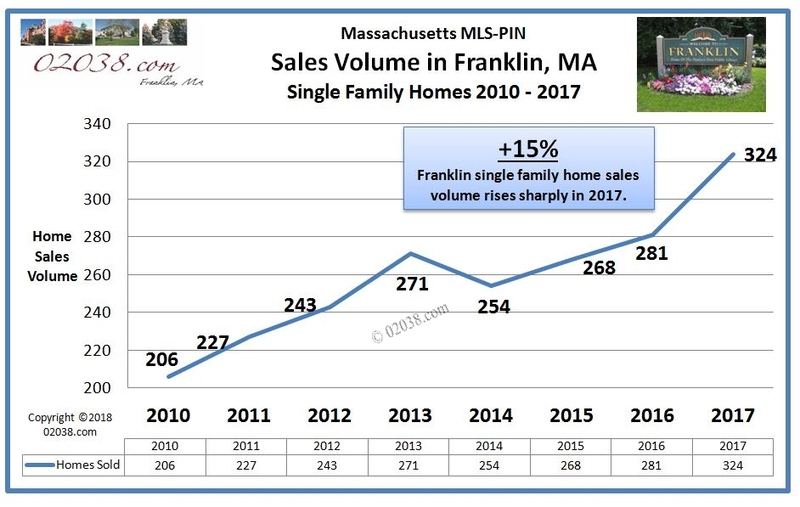 As tracked by MLS-PIN, the number of single family homes sold in Franklin, MA during 2017 soared 15% compared to 2016’s healthy total. This increase is especially impressive in light of the dramatically low housing inventory in town throughout the year. The 324 sales in 2017 is the highest annual sales total in Franklin in the last 12 years! Spurred by the high demand for homes, the median sale price of single family homes in Franklin rose nearly 8% in 2017. 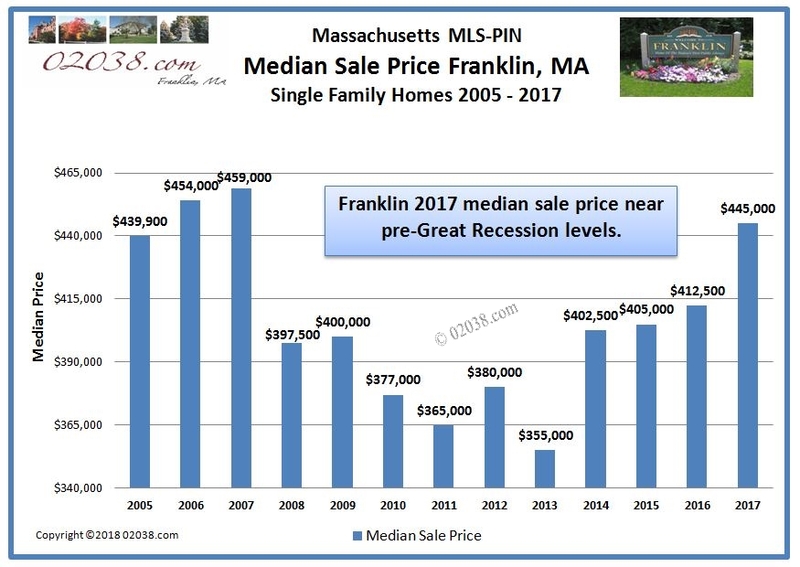 At $445,000, Franklin’s median sale price for 2017 is the highest it has been in the last 10 years. Quite an improvement over prices back during the Great Recession – this makes 2018 a smart time to sell! 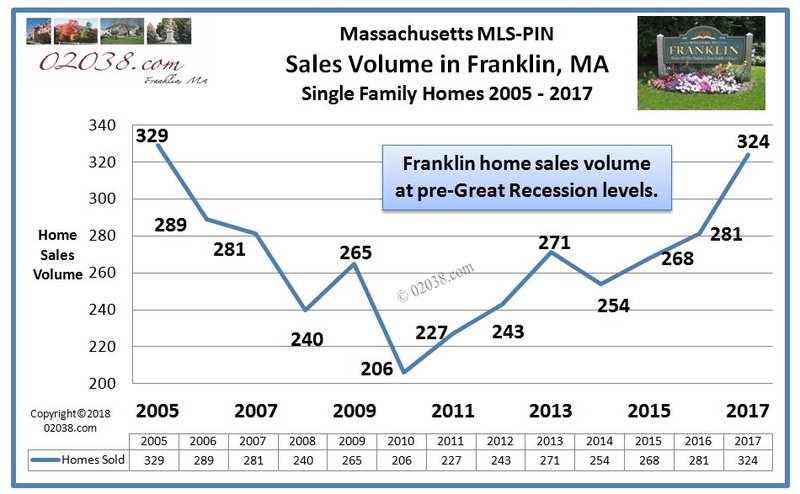 If you’d like to know what your home in Franklin, MA is worth in the current market, contact Warren Reynolds for a free, no obligation Home Value Report. Interested in condos in Franklin, Massachusetts? Follow the hotlinks to see the 2017 market reports for the Stone Ridge, Chestnut Ridge, Spruce Pond, Highwood and Franklin Crossing condo communities in Franklin, MA. Below, we’ll make a summary review of the overall real estate market in Massachusetts during the year just ended. 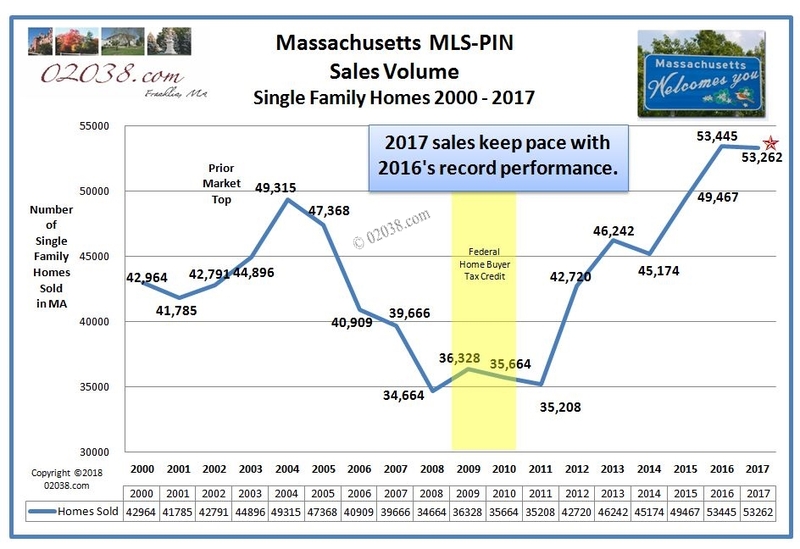 Massachusetts single family home sales volume as recorded on MLS-PIN slipped just a bit in 2017 from the record pace of 2016. However, 2017’s sales volume remained well in excess of what was achieved in any year prior to 2016 going back as far as 2000. This high sales volume in the face of the low housing supplies in the Bay State during 2017 is remarkable! 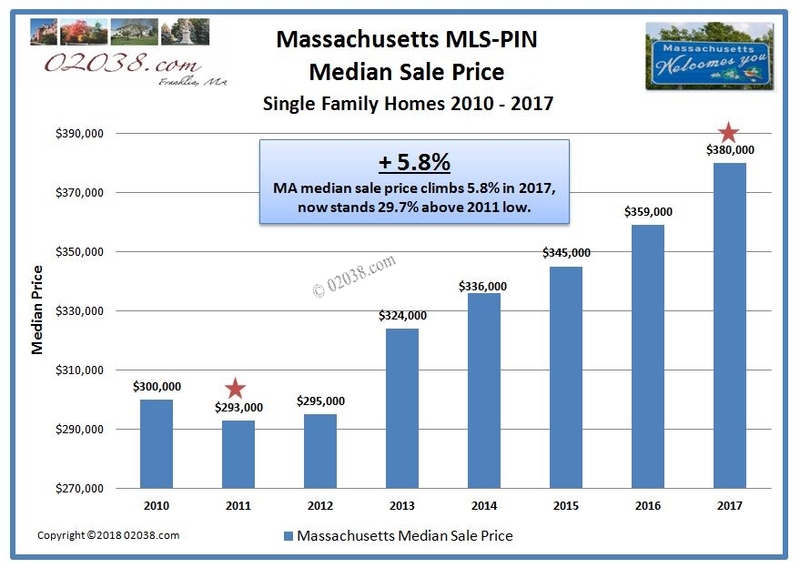 The median home sale price in Massachusetts was up nicely in 2017. At $380,000, the median sale price as reported by MLS-PIN stands nearly 30% above 2011’s Great Recession low. 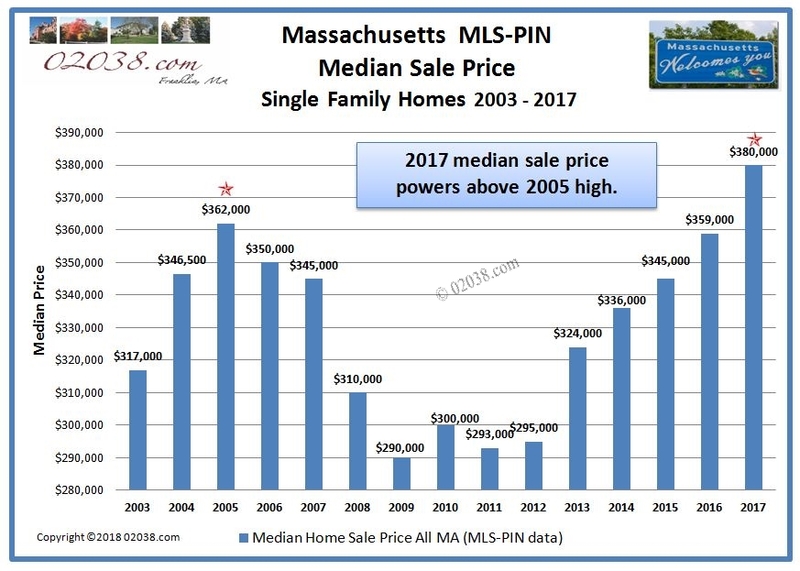 2017’s median is well above the previous high set back in 2005 – great news for MA home sellers in 2018!